What does Jon Koon's "Fabergé" Egg and Saks Fifth Avenue's Cafe have in common? Saks' new boss, imported in January from London's Harrods, is giving everyone at Saks a fashion-forward nudge, Cafe SFA included. Expect top-flight designer-inspired looks on every plate and a few retro dishes recalling Saks's midcentury glory days. Menus that would have been too daring for Saks in recent years are to be tested driven. 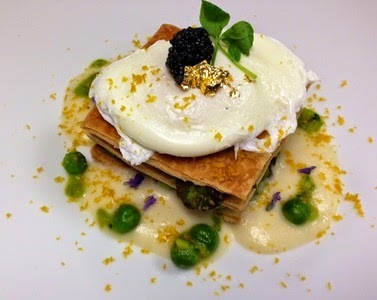 Taking a cue from fashion designer, Jon Koon of Private Stock, Chef Alex Reyes, the Barcelona born new arrival at Saks flagship store store, has whipped up a one of a kind sensation that screams spring and luxury and not a minute too soon: stacked a garden pea mille-feulle, bottarga, farm fresh perfectly poached egg topped with black caviar and gold leaf ($28). Meanwhile, is it not GORG? There's a cocktail to go with the "Golden Eggs" -- the Faberge Fizz ...I love that name! It's a Spring 2014 step-and-repeat of refreshing grapefruit juice, green Chartreuse, lime, mint leaves and egg-white libation ($14). You'll want a second. And both eggs and cocktail can be had for $38. from 10 a.m. – 4:30 p.m., and on Sunday from 11 a.m. – 4:30 p.m.
Love Fabergé eggs? Well, now you can go on a NYC hunt for some of your own in the name of charity and just in time for Easter! Yes...there's an app to help you and everything! The Fabergé Big Egg Hunt supports Studio in a School, an organization that brings visual arts and professional artists to more than 150 New York public schools each year. The event will also benefit Elephant Family as they continue their work to save the endangered Asian elephant from extinction. Following their appearance at the restaurants, the eggs will be moved to another location for the April 22nd auction. For more information about the Fabergé Big Egg Hunt, visit www.thebigegghunt.org. Happy hunting! Yes, Foot Health Is Stylish!